Gorgeous TOP Floor Penthouse with Ocean Breeze & Sunset Views! Steps to the Sand! Nothing compares to Mission Beach vacation rentals! Pet-friendly, oceanfront, and hosting amazing views, this home will win you over instantly. This ocean view penthouse, located in South Mission Beach, offers stunning views, comfortable accommodations, and a great location. This is the perfect place to host a family vacation or enjoy a quiet retreat with friends. This property has free high-speed WIFI, ocean-view balconies, fireplace, big screen smart-TV, cable, dishwasher, washer & dryer, two parking spaces, propane grill, elevator, and more amenities! Check the amenities section to see a complete list. Located at the southern tip of Mission Beach, this property is ideally situated for ocean front views without all the craziness of the boardwalk. The beach leads all the way to the front of the building, and it is only a few minutes' walk to the ocean. The bay is even closer – less than a 2 minute walk. There is easy access to parks, playgrounds, basketball courts, volleyball courts, and the boardwalk. Sea World is only a 5 minute drive away. This is a three bedroom plus den, single-story condo on the top floor of the building. There is elevator and stair access. The kitchen is fully stocked with all dishware, utensils, cookware, and appliances. There is also a washer and dryer in the home. Parking is a breeze with two reserved spots in the secure underground garage. Linens, bath towels, and beach towels are all included. All you need are your personal toiletries. Each bedroom has a flat screen TV and cable. The living room has a large flat screen TV and digital cable. There is a propane powered BBQ on the front patio. Two of the bedrooms have king beds. The third bedroom has two queen beds. The den has a queen-sized pull out sofa. The sofa bed has a special inflatable mattress for added comfort. As a den, this space has an open floor plan keeping with the airy quality of the home. For privacy as a bedroom, the walls retract to create a screened room. There is also a queen-sized plush air mattress available. The condo sleeps 10 comfortably, but can accommodate up to 12 guests. Interested in other pet-friendly Mission Beach vacation rentals? We manage several units of different sizes and decor in the same building. Clean, modern, best location easy access to everything. Landlord promptly responded to questions. The best views and locale to surf and paddle back bay. This end of mission beach is more peaceful than closer to Belmont park. Kitchen and baths were well equipped with toiletries. It was so wonderful we are plannind to book again. Amazing spot for a large group. Thank you so much for a great stay in San Diego. The units were well stocked beyond our expectations. It was a great location for our group and all of the activities we were doing while there. Becky and Jenelle were awesome to work with in planning our visit. And the view...amazing!! Everyone in our group said this was a place worth coming back to. Perfect location! Amazing views! Perfect size for 2 families to split for a memorable vacation! The condo was at the end of the amazing Mission Beach, just far enough removed from the crowds while still being situated within a 5 minute WALK to the ocean, the bay and a playground (and only ~15-20 min walk to Belmont Park). 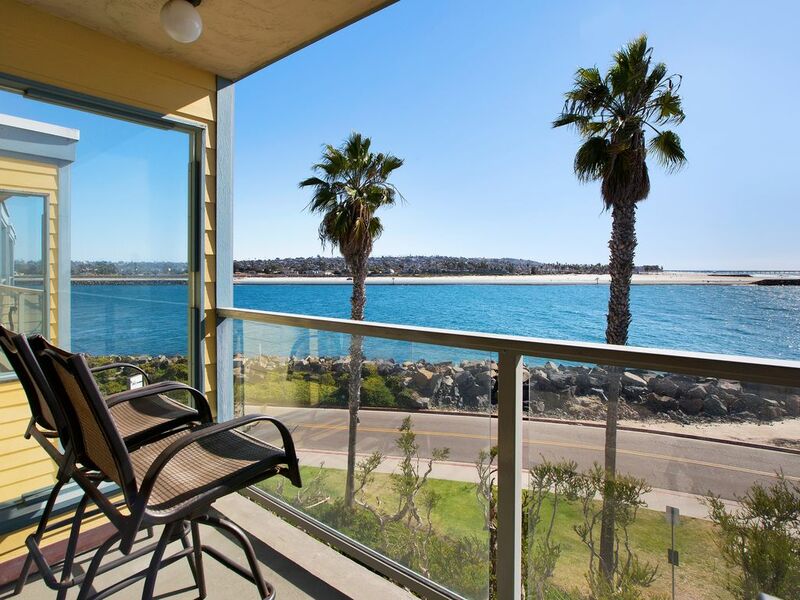 The views from within the condo were stunning and were a constant reminder of why you chose to vacation on Mission Beach/Bay. The condo complex contained super convenient beach gear storage & showers on the first floor so your beach toys & sand didn't have to come back upstairs with you. The unit itself was clean and stocked with all of the non-perishable essentials you need while having space to store anything extra that you wanted. The furniture was comfortable and had plenty of seating options for probably ~12 people (estimating as our group was only 7 total, 4 adults + 3 toddlers). The king bed in the 2nd bedroom (the one I stayed in) had a memory foam topper or similar on it which made it very comfortable as well. Only thing to nit pick on would be the 2 glass-topped side tables in the living room - not a great choice for 3 toddlers, but far from a reason to drop a star. There are about 6 different entry codes or locks to remember which is hard, so make sure to have them available on your phone or printed for reference. The only one that gave us trouble was the one for the garbage as it wasn't as easy to unlatch and relatch as we expected (or even easy to locate!). We also found it strange that there wasn't a recycling bin available; I guess that is some local regulation or something. The 2 times I contacted the management company during our stay they replied and addressed our concerns immediately (once because the cable box was on the fritz and once to dispose of something in a common area we unexpectedly came across). Neither issue was their fault but they remedied them asap to ensure our stay remained great - you can't ask for more than that! For dog people: There is a grassy area with a public dog poop bag dispenser and garbage can on the back side of the condo complex. This made it SUPER convenient to just grab our dog and leave without having to search for poop bags or lug full bags back with us - one more reason this location rocks! We had a great time in this rental for the week. The views were great of the channel and you can even see the sunsets on the ocean from the living room. There is a great breeze that comes in the windows and patio doors. The owners were very accommodating and kept in touch to make sure we had everything we needed. I would recommend this unit. It's a nice place, with a great view. We found a lot of minor maintenance issues. In his defense, owner offered to send a contractor over, but since we had two small children with us, that would have been pretty disruptive. We have stayed in this property several times in the past, and expect to do so again in the future. I would certainly recommend it to friends or relatives, especially if they want to stay in a comfortable, spacious location within a couple of minutes walk of the main beach, and have a great view of all the activity in the small-boat channel leading from Mission Bay to the open ocean. We have had good experiences with the manger over the years. In our experience, when unexpected issues have arisen, the manager has dealt with them promptly and effectively. In my view, description of the property in the website listing accurately describes the property. The elevator was under repair while we were there this time, and we were informed of that beforehand. The manager offered to have someone there to assist with our luggage on arrival. We declined the offer, as it is no big deal for us to pack our stuff up a couple of flights of stairs. Even when the elevator is operational, we almost always use the stairs instead. We understand that the elevator is back in operation (and it might have been while we were still there - we didn't check). The property was clean and well maintained. All of the systems within the unit seemed to be operating properly. We have never had a problem with break-ins. However, I would recommend that the locking mechanism for the sliding patio door into one of the bedrooms be upgraded from the standard "lever-lock" mechanism to something that would be a little more pick-proof. The property is well-located for getting around San Diego, although at certain times (e.g. a fine Saturday afternoon) the traffic over the bridge crossing Mission Bay gets a bit backed up. At most times, it is only 5 minutes or so from the property to I5 or I8 or Sea World, less than 10 minutes to Old Town, 15 minutes to downtown, the zoo, etc. The boardwalk, officially known as Ocean Front Walk, is a pedestrian walkway that runs approximately 2.3 miles along the beach from the end of Law Street in the north down into Mission Beach, ending at the mouth of Mission Beach. Along this scenic route are a number of local shops, restaurants, bars, and Belmont Park — a fun-filled amusement park for people of all ages. The Ocean Front Walk is packed with pedestrians, cyclists, rollerbladers, and tourists most days of the week, in particular on weekends, but it is worth it to brave the crowds and come check out this hotspot. To reach the trailhead, head toward the ocean once you reach Law Street and Mission Boulevard. Follow the clearly marked path to the left. You will be immediately greeted by views of the Pacific Ocean to the right, along with plenty of beach goers and slews of other people walking, biking, and rollerblading the same trail. To your left you will start to see a number of small beachside hotels. Approximately 0.5 miles into your walk you will see Crystal Pier, one of the top piers in the state due to the number of fish caught and the possibility of good-quality fish. If you want to add on some extra mileage, take a stop here and walk to the end of the pier where you can catch a spectacular sunset if you time your walk right or get a better view of the marine life and surfers below. From Crystal Pier, continue forward on the trail towards the main lifeguard tower. At this point you will be passing by the most crowded stretch of the Ocean Front Walk due to the number of popular bars and restaurants nearby. This is also where most people set up camp for basking in the sun and frolicking in the cool waves. If you will be riding a bike, exercise caution in this area because it can get very crowded, especially on weekends. The next mile will continue to be crowded, however if you push through the masses you will suddenly find the crowd thins as you pass by the remaining bars, shops, and beachside hotels. Now you will start to see vacation rentals and apartments on your left — passing by the occasional bachelorette party or family weekend getaway in the beautiful properties to your left. To your right the Pacific Ocean will remain a constant site for the entirety of your walk. At approximately 1.5 miles down the trail you will see Belmont Park in the distance, noticeable by the staggering roller coaster that soars above the amusement park. You’ll also come across more bars and restaurants — letting you know you’ve now crossed into Mission Beach. It is easy to get distracted at this point and want to let out your inner-kid, riding the roller coaster and maybe even stopping for a game of laser tag. If you are disciplined enough to stay on course, continue down Ocean Front Walk past more beachfront homes and condos, ending at the South Mission Beach parking lot where there are typically fewer crowds. Here is where you will turn back around and retrace your route back north to Law Street. This is your adventure so if you get distracted stopping at Belmont Park, grabbing a sweet treat at one of the stands, opt to become a beach bum, or want to grab a cold beer on your way back, no one will judge you. After all, not every hike is this scenic and lively, might as well take full advantage of your surroundings. Daily and weekly rentals available. Rates range from $650 - 850 per night and $3000 - 5500 per week. Rates vary based on season and availability. Ask us about off-season and last minute specials and discounts. Call or email for best quote.